In case you're not familiar, the Stirling engine got it's start back in 1816 when Scottish minister Robert Stirling patented a closed cycle air engine. 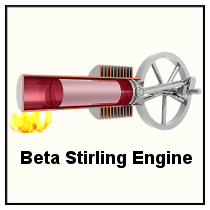 Usually, a Stirling engine has either one or two cylinders in a closed system. Unlike engines in today's cars, the Stirling engine doesn't pull air in from an outside source, go through the combustion process and then expel the exhaust to the outside. All the air or working fluid stays within the system. The Stirling engine works by applying a heat source to one side, while the other side remains cool. This causes the internal air or working fluid to heat up on the hot side. As the working fluid heats and expands, it causes a piston to move. As the working fluid is pushed to the cool side, it contracts and the piston moves back. Until now, Stirling engines have mostly been large industrial models or small hand-held classroom versions used in sciences classes. Volo has introduced a 1KW version that is more appropriate for a home setting. The Volo Stirling engine started off as a Kickstarter project in 2011. Over the last couple of years, Volo has experimented and refined the engine to a degree. The length of the engine is roughly 5' with a 10" diameter. The engine is still somewhat rough looking. It is a garage project and not financed as a huge start-up. It will most likely get cleaned up as production is ramped up. The engine can be powered by any heat source like wood, propane or solar. Heat from solar seems like it would be ideal for areas that have a good amount of sunshine. If you are interested in reading through the development of the engine from the beginning, you can click through to the Volo Designs Blog. The engine is being sold at the Sefton Motors Site where you can find additional accessories, including a permanent magnet generator that can be attached to generate electricity.